WOLFGANG KAEHLER has photographed around the world for prestigious magazines and travel companies since 1977. 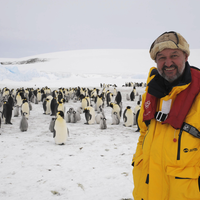 He has traveled to Antarctica over twentyfive times. In 1985 he was awarded First Prize in the Composition & Form category of the "WILDLIFE PHOTOGRAPHER OF THE YEAR" competition, sponsored by BBC WILDLIFE and the MUSEUM OF NATURAL HISTORY in London. His winning photo, "Penguins on Ice", was one of 8,500 worldwide entries. In 1988 he was selected by National Geographic as one of 100 photographers for a worldwide exhibit and book "ODYSSEY-THE ART OF PHOTOGRAPHY AT NATIONAL GEOGRAPHIC". In September of 1989 his book, "PENGUINS", was published by Chronicle Books in San Francisco, in August 2005 his book “Charles Darwin’s The Voyage of the Beagle” was published by Barnes & Nobel.